Thuan “Scotty” Nguyen, which is pronounced as “win”, was born in war-torn Vietnam, and later came to America at the age of fourteen. He started his poker career at a very early age, while he was still in school. During that time he was expelled from school due to spending a lot of time playing in underground poker games. With his ambition set on poker, he went to dealer school and then went off to work for Harrah’s, in their poker room. Interestingly enough he would use his nightly wages to play poker, however he saw himself losing most of the time. His luck changed in 1985 where he was invited to deal at Lake Tahoe, where he would deal and play in cash games with the small amount he brought with him. During that time he built up his bankroll and returned to Las Vegas, with a great sense of confidence, where he managed to make his first million. As mentioned before, his luck changed when he played and dealt at Lake Tahoe, only to find himself back in Las Vegas earning his first million. After that impressive feat, he found himself being the talk of the town; his name and reputation got spread around like wild fire. Next thing he knew he was playing with some of the great poker players of that time, Johnny Chan, Puggy Pearson, and David Grey. His great success got to his head and started to gain bad habits, such as using marijuana, cocaine, and alcohol. Along with the bad habits came a losing streak, where he lost his million dollars. He brushed himself off and started to rebuild his bankroll. His second-first success came at the 1997 World Series of Poker where he won his first bracelet, winning over $150,000. The money did not last very long, as he lost most of it before the 1998 WSOP championship. Not having enough money to buy-in, Mike Matusow saw his potential and paid for 1/3 of his buy-in. Matusow was not disappointed, since Scotty won that year, a total of $1,000,000 where he gave 1/3 of it to Matusow. Scotty does not wear his 1998 bracelet because the very next day his brother was killed in a traffic accident. His winning streak did not end though. 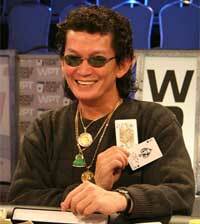 He managed to win 2 more bracelets at the 2001 WSOP tournament playing Pot Limit Omaha and Omaha Hi/Lo. He made off with over $400,000 during those two wins. He continued to play in tournaments, but did not get his last win, for now, until the 2008 H.O.R.S.E. championship at the WSOP; he won nearly $2 million. Scotty Nguyen’s life has been full of ups and downs, drawing controversy from fans, commentators, and fellow poker players. With his early addiction to alcohol and drugs, he would always seem to spend all of his winnings from the night before. This continued to be a problem for him throughout his career. During the 2008 WSOP tournament, which he won, he was shown as being a troublemaker. They showed him drinking heavily, while insulting and heckling the waiters/waitresses, as well as the poker players at the final table. After the tournament he saw that his actions were less than good. At that time he apologized to his fans and everyone else involved. He stated that it was due to a mix of pressure to win, stress, and exhaustion. Ever since then he has been caught saying that his fans are his number one priority and that he will try his best not to let them down. This is the reason his nickname is “the Prince of Poker”. Scotty’s success has come with controversy and misfortune, but his skills at poker are undeniable. During the WSOP tournaments, he has been able to win a total of 5 bracelets. He also has had 37 money finishes, which is where his reputation began from. His win in 1998 got him to the highest ranked ITM finish of that year. He also participated in the World Poker Tour, where he has won 1 title, 8 final tables, and 17 money finishes. He has had only 1 money finish at the European Poker Tour, but we can expect him to continue playing and winning. As of 2010, his total live tournament winnings were over $11,250,000, which roughly a 1/3 of it comes from the WSOP. He also plays other games such as blackjack and has appeared at various tournaments involving blackjack.